Both Western and English bridles consist of a headstall, bit and reins. You can adjust the buckles and straps connecting each part of the bridle, to prevent rubs and sores on the horse's head. You can only fit a bridle properly when it is actually on the horse's head, so have your horse groomed and waiting when you're ready to adjust the bridle for him. The headstall goes around the head, behind the ears and down the sides of the face to connect the bit to the bridle. The reins connect to either side of the bit. The headstall also includes the browband, a segment of material that passes across the horse's forehead and under his forelock. Most headstalls have a strip of leather that passes behind the ears, but some Western bridles called split-ear bridles fit the leather over an ear. Headstalls must be adjusted so that the bit fits properly in the horse's mouth. The bit sits inside the mouth on an area of the gums between the back teeth called the bars. Bits should fit with a tiny wrinkle near the corner of the horse's mouth when he has his mouth closed. To adjust the headstall, open the buckles on the cheek pieces on each side and adjust the strap until you see one wrinkle near the corners of the mouth. If you see so many wrinkles the horse looks like he's smiling, it's too tight. If the bit is hitting the incisor teeth, it is too loose. Each of the many types of noseband, which attaches to the headstall, fits slightly differently. A simple noseband consists of a strip of leather that fits over the nose well above the nostrils. You should be able to slip two or three fingers between the horse's jaw and the noseband. You can change the fit with adjustable buckles. The throatlatch goes underneath the horse's cheeks. It prevents your horse from pulling or rubbing off his bridle. It should be loose enough so that you can slip three fingers between the throatlatch and the horse's throat. Adjust the buckles so that the throatlatch fits properly. If it's too tight, it can interfere with your horse's breathing. Too loose, and it will flop around and be ineffective at keeping the rest of the bridle in place. A curb chain fits underneath the horse's lower lip. 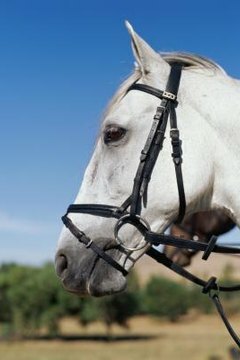 It is common on so-called double bridles or Pelham bits, bridles with two sets of reins leading from the horse's mouth to the rider's hands. These bridles have one set of reins that attach to the bit, and a second set that attaches to the lower portion of the bit shank. The chain wraps underneath the horse's lower lip and attaches with a hook. To fit it properly, lay the chain against the horse's jaw so that the flat section of the chain faces the horse's chin. Slip one or two finger between the chain and nose and attach the chain to the hook on the bit, slipping a link over the hook.